Crown Pottery Mark With an 'M' Above Query:- hi, can you identify this pottery mark backstamp which is on the bottom of a tea pot? Many thanks for re-photographing your crown mark with a nice clear close up shot. Great work! Now we can get on with the business of trying to identify the maker. The bad news is the crown mark is the most commonly used mark in the history of fine china making. There are literally hundreds and hundreds of makers in my reference books and your particular very distinctive crown is not a pottery mark shown in any of them, I'm afraid. It is therefore very unusual for the maker not to give initials or further identification, because they must have been aware it makes identification of the maker almost impossible. This leads me to think the maker is either an insignificant company trying to blend in and be mistaken for someone better, or a maker so famous as to need no introduction - a pearl amongst the masses, as it were. So let's see which firm might be so magnificent as to think itself instantly recognisable. Possibly Minton's, Mason's, Midwinter, and Meakin's I would also put into the 'big head' league. None of the crowns matched these makers though. The other very well known firm in their day was John Mortlock - a retailer said to match Harrods in their heyday. It would not surprise me if the mark was that of Mortlocks, because the type of crowns shown in my books were similar, but not the same. However, normally, at least in all the examples I have seen, the backstamp shows the John Mortlock name in full as well as other devices (often a globe). However, your mark may have been a less used variation. Only a specialist would know. 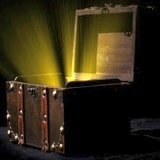 At this point, I'm sorry to say I've run out of ideas, so let's hope someone knowledgeable stumbles across this thread and leaves a reply, or you can use a professional appraisal service to save time and effort. Hope this information has been of some use to you. Hi there i have too a tea set with this mark so would be grateful if anyone knows anything about it? 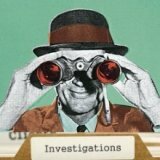 have been researching and cant find anything. "We just bought a teapot stand with this mark..... By the way We saw a similarly designed piece by Alfred Meakin on ebay. Thanks for the clue Gary & Jacky! I think Alfred Meakin (not to be confused with J & G Meakin) is a likely candidate and one I missed in list above. I could not see this exact crown mark in the marks I have in my books or online, but they are similar in style. SO with the evidence of what you saw on eBay and the fact they are an 'M' manufacturer who used a crown device in their markings, I think we can safely say this is most likely Alfred Meakin. Similar patterns will possibly show up on J & G Meakin wares and Johnson Bros because there are very close family ties between these 3 firms. We have a tea set with the same mark as in the photograph. 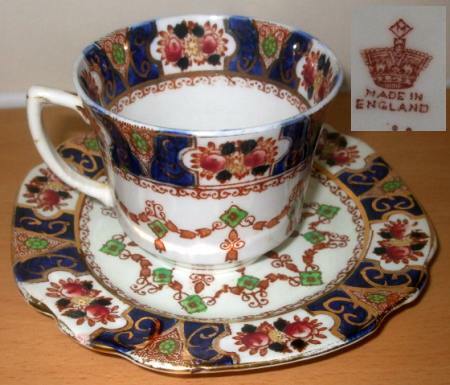 One piece only (in the same hand painted design as the rest of the set) has no crown and 'M' but is inscribed in gold with 'Dorio (Doria, maybe)China England. Does this help in the identification of the maker? Many thanks for the useful comment above. I looked up Doria or Doria China, but could find nothing. Anyone else have any ideas? I have a Crown Potteries white saucer with decorative trim..on back below Made in USA are the numbers "2 46"....what do these mean? I have a beautiful tea service with this very mark . The BBC are well known for historical correctness and this same service was used in an afternoon tea scene in the programme. The answer may be here. This mark is from Doric China Co. High St., Longton, Staffordshire Potteries (later taken over by Royal Albion China Co.). It dates from 1926-1935. We recently acquired a few cups, saucers & plates and found their 'Crown with an M above' mark in Godden's Encyclopdia of British Pottery and Porcelain Marks. Small 'M' Crown Query - THE ANSWER!!!!!!!!!! A brilliant assist by Rog to one of the most long standing queries on this site. Thanks to Rog. One of the biggest problems with solving this mark (apart from why the 'M'?) was firstly the sheer volume of crown marks used by Staffordshire pottery makers. There are many hundreds, if not thousands to plough through. The second problem is the obscurity of Doric China Co., a tiny very short-lived firm sandwiched between around 70 other Longton makers most of whom were bigger and better known. However, the third and most difficult problem is how Godden's Guide (the no 1 authority on English marks) lists their marks. They don't have sections for different types of marks. Instead they list by name alphabetically. So to find a crown mark maker means you have to go dutifully through this very thick volume page by page, which is clearly what our hero, Rog, must have done. Well done Rog! Kovel's guide is a good resource, and it lists by type of mark (i.e. there is a crown section), however, it does not list this particular Doric China mark (it list two others which use the name 'Doric china'). As I say above, Doric China was a very short-lived firm, particularly in comparison to some of its neighbours (Aynsley founded in 1780 and one of the few still remaining - standing proud - I saw them with my own eyes when I was in Longton the other day - May 2011 - my latest piece, a Staffordshire flatback of the Royal Wedding is being made nearby). Doric China operated from the dates of 1924 to 1935. 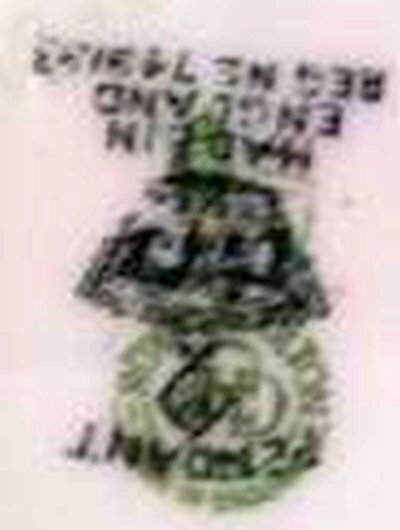 They used the Crown with M shown above from 1926 - 1935. In 1935, nearby firm Royal Albion took over the orders of Doric china and continued with their marks including the M Crown until 1948. 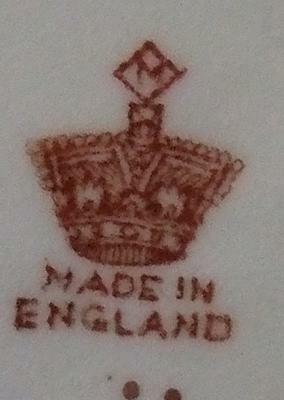 The Royal Albion version of this mark had an M in a rectangle added below. I have no idea what the M stands for - which is another reason why it has taken so long to solve this mystery mark. They abutted onto the same building as Hammersley & Co. (Longton), Ltd although Doric China Co frontage was on the High Street to the north, whereas Hammersley's entrance was to the South on Sutherland Road. Nearby on Sutherland Road were John Aynsley & Sons and Paragon China. Opposite on the High Street were Gladstone China, Roslyn China and New Park Potteries. Hudson & Middleton's Delphine Pottery had a unit nearby off the High Street, Longton and a frontage off Normacot Road, with their associated unit of Chapmans the next unit down from Doric China. As you can see, the Longton potter fraternity was very close knit with many intertwining associations, not to mention rivalries. Is there any way to then determine the pattern? I was given a tea set similar to this for my 21st birthday with the same mark. The colours are very similar, and the handle on the cups, etc, look the same. 987 is written on the bottom of one of the tea cups. It is a rose pattern on rust rectangle alternating with a blue rectangle with a gold swirl. 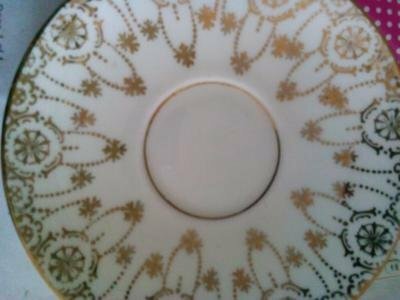 I just acquired a 6 cup and saucer set and stumbled upon this page trying to identify it. thanks so much! I am wondering what the approximate value is for the set. It also includes 6 desert plates, a sugar bowl, cream bow and large plate. I also have fifteen tea plates fifteen cups and saucers, two sugar bowls and a milk jug. Also on the bottom of the cups are the numbers 2191 in gold and what looks like an s also there are small green markings. I have been left quite a number of items of this pattern, one with the same crown mark, another with the mark and MADE IN ENGLAND underneath, some with Doric Bone China and others with J.M.&Co in a diamond with DEVON underneath. The China Peacock of London lists the pattern as Un-named. Blue & Rust,Floral,Swag,Gold Trim, so maybe they took over the design from Royal Albion. Thank you all for making my job easier . Now I can sleep at night knowing what crown with a M means. I too have a small set of the china commented on - it has the crown with the M above also the number 2191 in gold, and a green mark. I have 6 cups, 6 saucers and 6 bread and butter plates plus a larger plate, a serving plate I think. This is only half the set, the other half is in Australia with my cousin. Inherited from our Grandmother. I would like to find out the value of it as I have no-one to pass it on to, so would like to sell it. Thanks for any information. Hi...I have the same china as the cup above. My grandmother in England owned the set, and pieces of it were sent to me in 2013. The number 2191 is on the cups with a green dot. Does this china pattern have a name? I have stumbled across this thread trying to find the pattern name for the design shown. It is perfectly correct that Royal Albion made a very similar design called 'Sandon' but the borders particularly are different and the colours on the swags not quite the same either. I have several pieces of this china and the pattern number is only on the cups. However my pieces do not say "Made in England" but just "England". 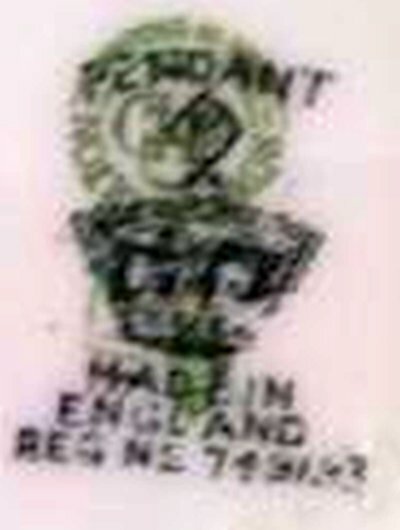 I always understood that this placed them in the late Victorian period as "Made in England" was the stamp required from early 20th century onwards (?not sure of actual dates?) However my pieces do say Royal Albion China and have the crown with a square rather than the diamond with M. This is all a bit conflicting if Royal Albion were only operating from the 1920s onwards under that brand. I collect bits n bobs of China/porcelain that I take a fancy to, so not an avid collector and with limited knowledge. I purchased a coffee set, pattern name "Pendant" and when I googled it, it identified it as Minton on every site. So here's where my confusion starts....on the back of the saucers, is the Royal Doulton mark with the mark I wasn't sure about stamped on top...... the mark has been identified on here as that of Doric China. I have read about the merger of Minton and Doulton, but where does Doric fit into the picture? Thanks for posting an interesting conundrum. The selling sites that list this pattern as Minton are displaying a mix of wishful thinking and avarice. Avarice because they know they will get more for Minton than most other makers. Enough said. So this is Doric china, as we have unearthed on this site (see Rog's entry above) - and confirmed by Goddens. 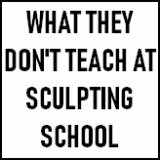 So why has it a Doulton stamp too? Doric was a small in trouble maker and they obviously needed to source some whiteware from a bigger maker to fulfil and order - and just blasted their stamp over the top of Doulton's. From the evidence, this item was potted by Doulton between c. 1920-1927. The lion, as I understand, came after 1920. After 1927 there was a number to the right of the crown which appears not to be there from the photo. The merger of the Doulton and Minton didn't happen until 1968 - but in any case that's irrelevant here. The Doulton stamp in your photo is upside-down. The green mark on the back is the hand painters they would have been piece work. It will be the same colour as the pattern. My paintress mark was an m with a line under. My family also had a lot of employment history in the potteries. I have a number of Doric / Albion pattern RLB2191 pieces.Which is similar but to but not Sandon as you are aware. I have some Royal Albion Burma and it has this exact mark. Google it, hopefully this solves your mystery. Crown above "MADE IN ENGLAND"
I have this was basin set but can't seem to identify the marks. I also am unable to find even any type of similar style. It is a dark pink and cream color, the pink on top and bottom and the cream in the center. It has to people " in love" looking outdoors with a dog and maybe a sheep. ? I just am having a terrible time finding something even slightly similar to be able to possibly find the maker or a step in the right direction. I am also curious as to the value.